Linmore LED Lighting Labs is focused on developing LED lighting solutions that are in the top 1% of performance in any product type offered. Ultra Performance Lighting is more than a tagline, it’s their guiding principle. They design products with end-user value in mind. They seek to deliver LED lighting solutions that will minimize energy consumption, minimize maintenance costs, elevate sustainability, improve aesthetics, and correct lighting levels, and now they want to push lighting innovation to deliver wireless data through LiFi. With an estimated 3-4 billion installed fluorescent tubes throughout the world, Linmore LED has seen an opportunity for their business to offer even more than their efficient LED Lighting to customers. They share a vision that will offer the world light and high speed, secure wireless data. Untethering these spaces from wires and in some cases offering wireless connectivity where there has never been before. Until recently, most LiFi lighting fixtures were small lamps or recessed can lights. Now, by coming together Linmore LED and pureLiFi have introduced the first LiFi enabled LED light bars designed to replace fluorescent tube lighting. Retrofit fixtures, even those that are not LiFi enabled, are in great demand as many facilities seek to drive down energy costs by as much as 70-80% by converting to LED technology. This trend is also being driven by the increased operating life of LEDs and concerns about the toxic mercury utilized within fluorescent lamps that complicates disposal. This new innovation provides a very real scenario where building owners and facility managers can adopt LiFi technology while dramatically decreasing lighting-related energy costs at the same time. says Prof Harald Haas, cofounder of pureLiFi and Inventor of LiFi. 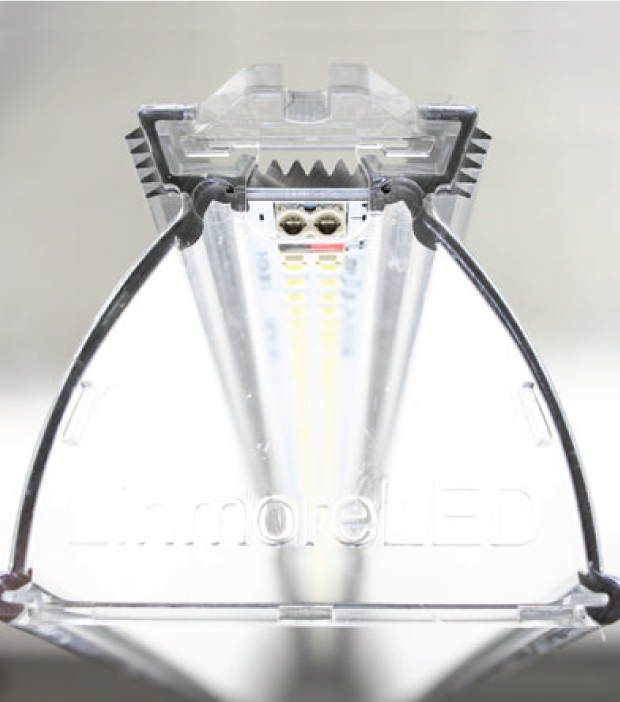 According to Paul Chamberlain, CEO of Linmore LED, the partnership with pureLiFi was a good fit due to the modular nature of the company’s LED light bars. The product’s design allowed for the integration of the Li-Fi chipsets in the ideal position on the light bar, without affecting critical aspects such as lighting distribution, thermal dissipation or overall performance. Among the expected early adopters of the technology are those that seek the greater security of data transmission than is possible with Wi-Fi. For this reason, initial markets expected to adopt LiFi technology include federal government and defence, banking, financial institutions and hospitals. LiFi is an infinitely more secure form of data transmission than Wi-Fi because a receiving device must be directly within the cone of light to receive a broadcasted signal. Visible light, including near-infrared wavelengths, cannot penetrate opaque objects such as wells, which means that the wireless signal is constrained to within a strictly defined area of illumination. LiFi can offer greater data density allowing for a better user experience as it reduces the need to share the wireless bandwidth with other users. LiFi can achieve approximately 1000 times the data density of Wi-Fi offering more data per square metre. This is an important factor for wireless efficiency. By deploying LiFi for wireless off-loading you can release spectrum for connecting more devices in heavily populated offices, meaning daily work involving conference streaming, remote desktops, and high bandwidth video streaming can be performed with ease. Now that one of the final barriers to full-scale implementation has been overcome with the introduction of LiFi enabled LED light bars, the technology is expected to continue to advance under an “aggressive strategy of miniaturization and lower costs,” says Haas.